Shaba, now nearly two years old, is the proxy matriarch of the younger Reteti orphans, teaching them how to forage in the wild. Under the eye of caretakers, she leads her small herd into the bush outside the sanctuary, stripping leaves, tasting bark, pushing down small trees, taking mud baths. Image by Ami Vitale for National Geographic. Sunday night has been elephant update night for Anne. My head is swimming in new information and stories. 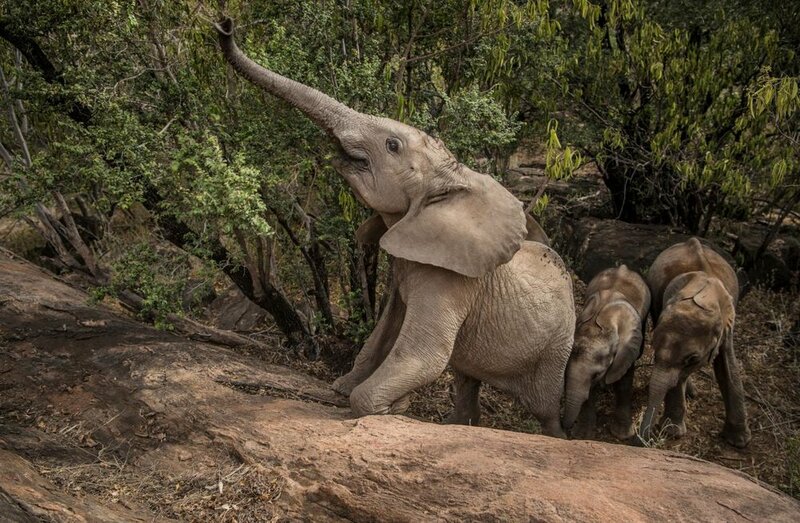 Before I venture out, let me share this charming, empathetic story in National Geographic about Kenya’s Reteti Elephant Sanctuary in Kenya. A few weeks ago, AOC featured the entire short virtual reality film ‘My Africa’, narrated by Lupita Nyong’o and set among the Samburu people. The region of the film and this May, 2017 article includes the Turkana, Rendille, Borana, and Somali peoples — besides the Samburu. Knowledgeable about many of the civil wars that have ravaged Africa (and America) I’m not familiar with tensions in this area. The point of our story and ‘My Africa’ is how these ethnic groups are working together today to strengthen their communities while protecting the estimated 6,000 elephants, according to National Geographic, who share the land. Mary Lengees, one of Reteti’s first female elephant keepers caresses Suyian, the first resident. Suyian was rescued in September 2016 when she was just four weeks old. Image by Ami Vitale for National Geographic. In fact, I pursued the article because of this beautiful image of Mary Lengees, one of Reteti’s first female elephant keepers and Shyian. Upon landing at National Geographic, I felt a poignant moment for Shaba, a little female elephant who is now the boss. So much has been written about the great elephant matriarchs, strong leaders who sleep hardly at all to protect their herd. The notion of a baby girl elephant’s natural instincts taking hold, making her the leader and caretaker long before her time is due reminds me of stories of young girls with countless siblings — too many for mom to manage — or even orphan girls with young brothers and sisters who suddenly rise to positions of leadership, almost out of instinct. Ami Vitale writes: “Right now Shaba is the boss. She leads her small band of baby elephants into the bush around the sanctuary, stripping leaves, tasting bark, pushing down small trees, and, best of all, taking luxurious mud baths. When Lupita Nyong’o narrates ‘My Africa’, she tells a delightful, romantic story of the singing wells. Actually, baby elephants, in particular, fall into them and previously were left to die. Vitale writes in the same lyrical prose, though, about the singing wells and in a moment of supreme quiet and reflection, we hear Kenya and the Samburu people calling us to witness the essence of humanity. “The riverbed that the Samburu men have come to looks dry and unyielding, but just below the surface is water. Elephants can smell water, and Samburu families, guided by elephants’ scrapings, have dug narrow wells to reach the cold, clean, mineral-rich elixir. Each family maintains a particular well, which can be as much as 15 feet deep. While drawing water, Samburus sing a rhythmic chant praising their cattle, luring the animals to the life-giving source. During the dry months (February, March, September, and October) the Samburu deepen their “singing wells,” and elephants, desperate to drink, come to the wells too. Sometimes they lose their footing and fall in. Let us not be total romantics. In this sad case, the baby elephant dubbed Kinya died. Still, elephant lovers worldwide can marvel and celebrate the work being done by Samburu women and men to protect the irreplaceable majesty that is Africa: its people, its irreplaceable animals, its ancient, complex knowledge and traditions and the historically strong role of women — much stronger than in the Western world — on the continent. This assertion doesn’t mean that the patriarchy didn’t touch Africa. Of course, it has. But African women have an ancient history far more influential and balanced than American women, who have historically had a narrow lane of achievement governed by patriarchal laws and customs. To discover our own power and resilience, we must learn lessons from Shaba, the little girl elephant who seized her own stature and influence. With no matriarch present — not patriarch, as elephants have a matriarchal social organization — females of every age learn how to step up to the plate at Kenya’s Reteti Elephant Sanctuary.